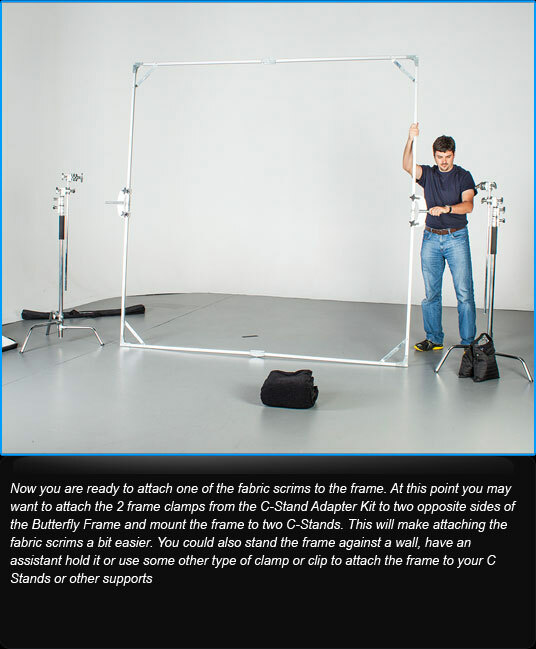 Introducing the Digital Juice Butterfly Frame Kit - see it in action! 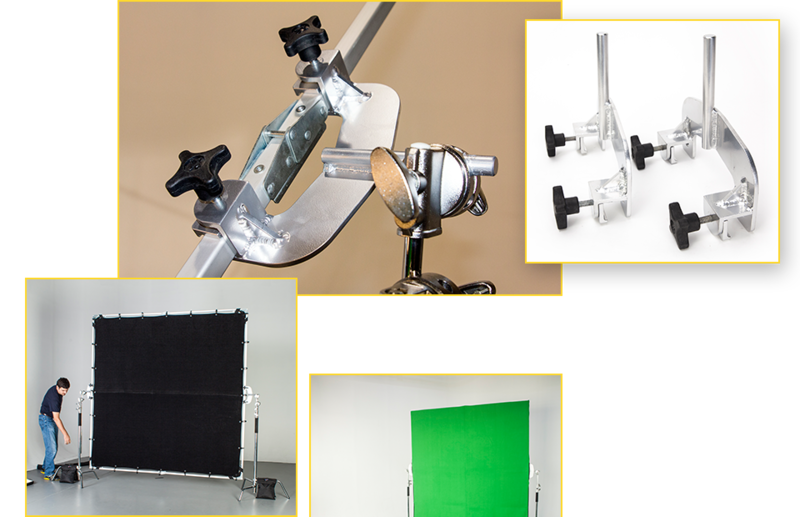 Providing innovative gear that is affordable, highly portable and of a professional quality is always our goal at Digital Juice. 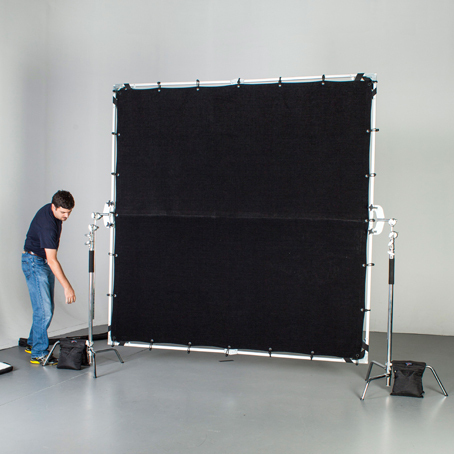 Our Digital Juice 8' x 8' Butterfly Frame Kit its the bill perfectly. 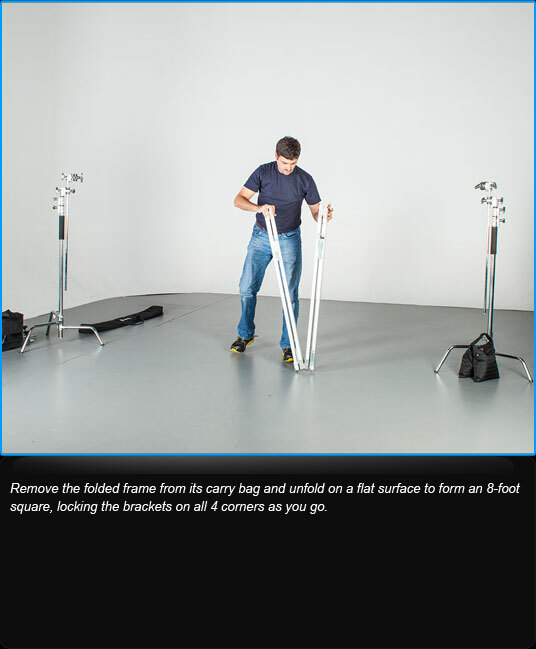 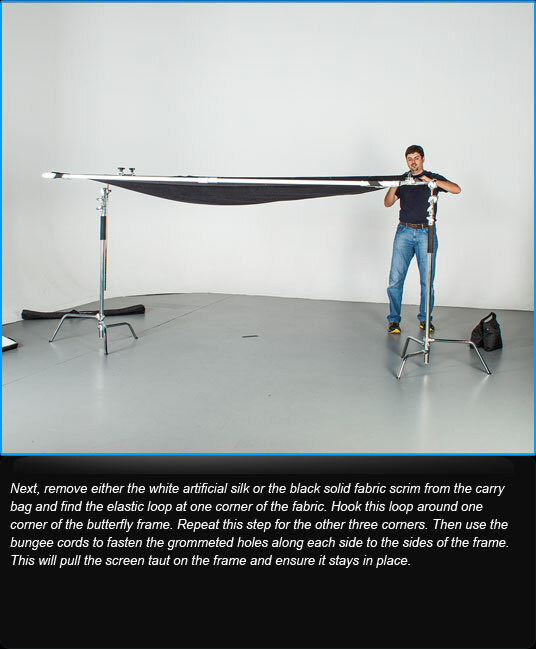 This kit includes a lightweight, collapsible 8' x 8' aluminum frame, two fabric light modifiers (white artificial silk and black solid) for softening or blocking light while shooting in studio or on location, two compact carry bags, a C-Stand Adapter Kit with two frame clamps and 28 specially designed bungee cords to attach the fabric scrims to the frame. 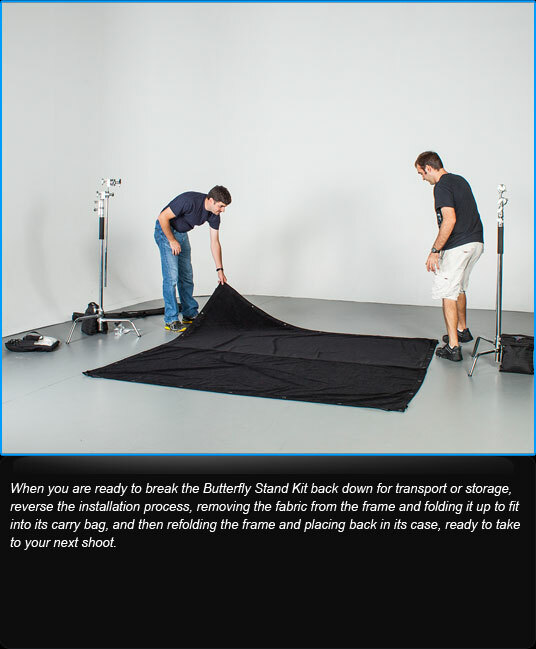 While normal frames of this size need a large vehicle for transport, the Digital Juice Butterfly Frame Kit can be folded up and transported with your other gear with room to spare. 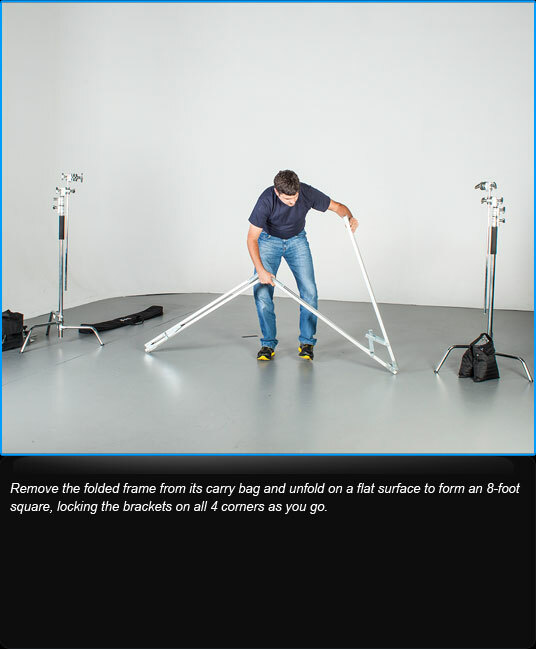 Best of all, it can be carried and set up by just one person. 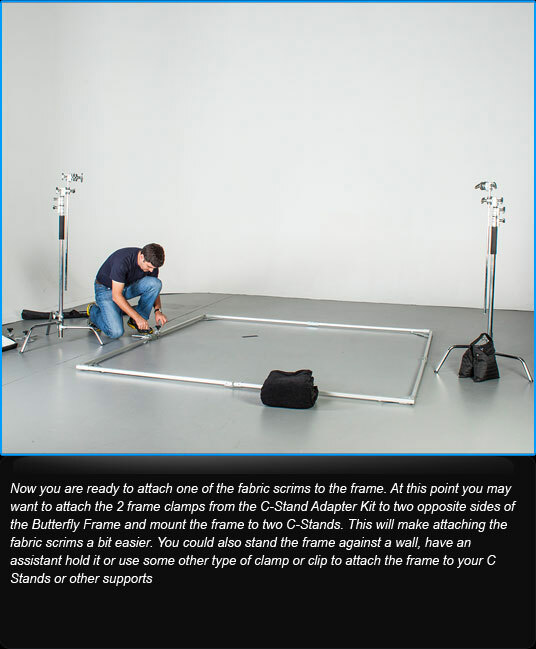 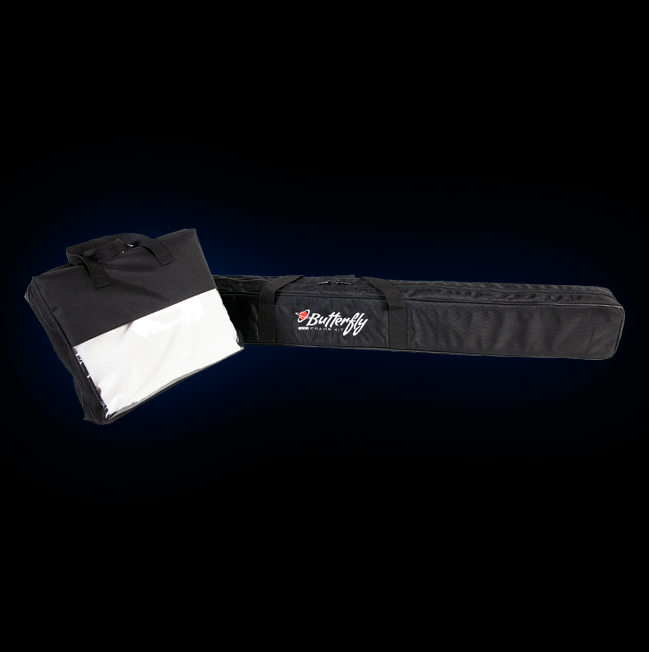 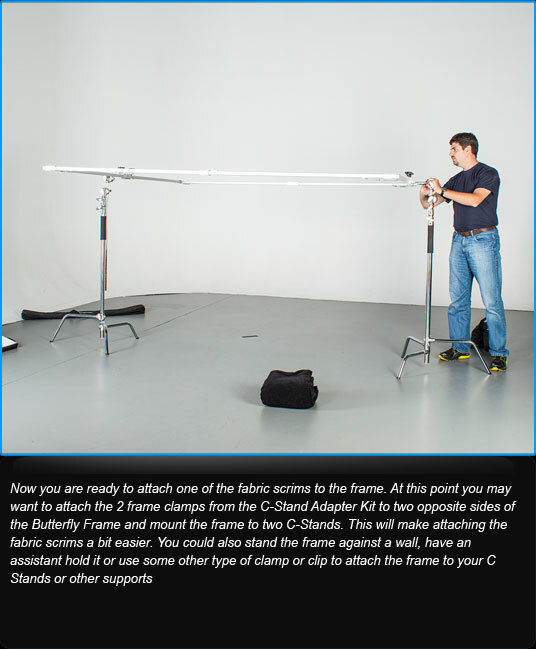 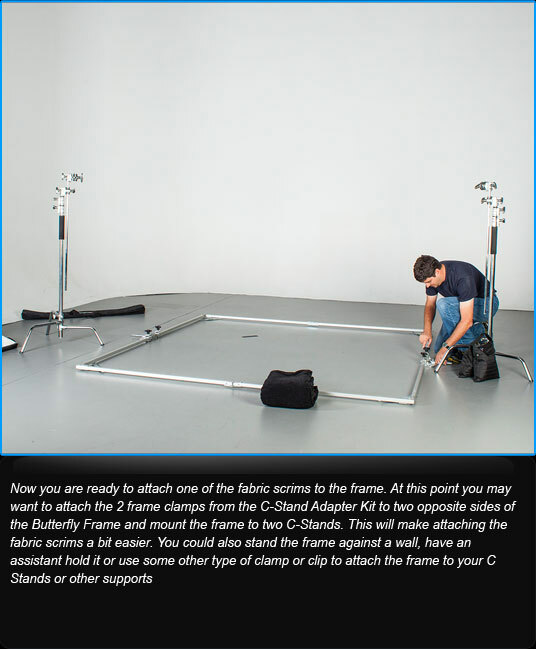 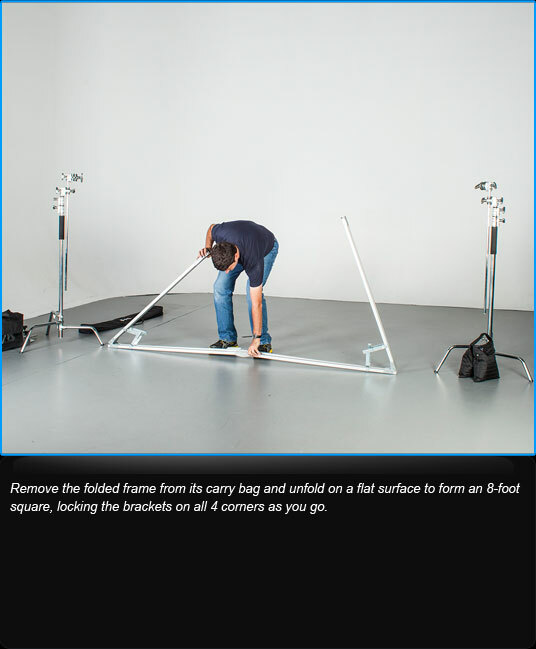 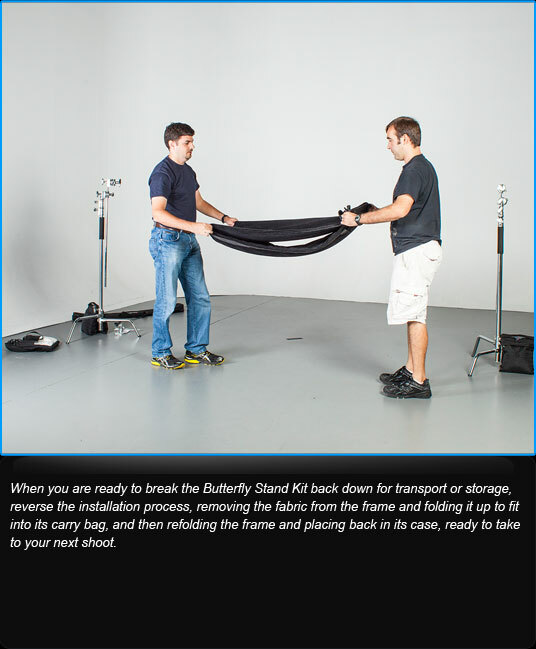 The Butterfly Frame Kit comes in two bags, one for the black solid and white artificial silk fabric scrims plus the bungee tiedowns, and the other for the 8-segment collapsible frame. 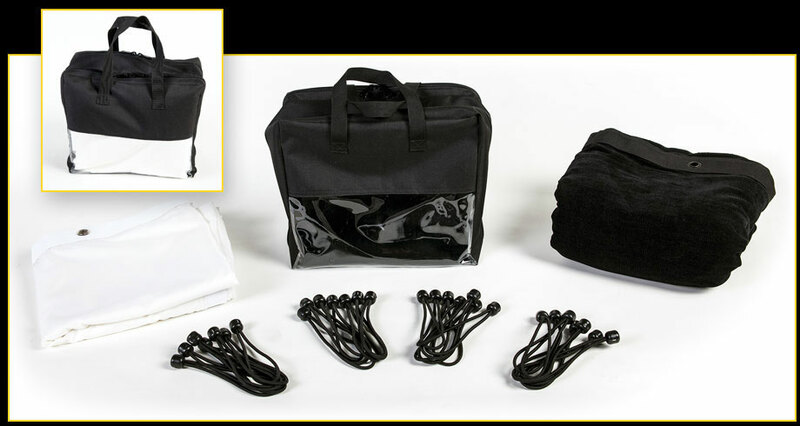 These carrying cases help to protect your new gear and make transporting as easy as possible. 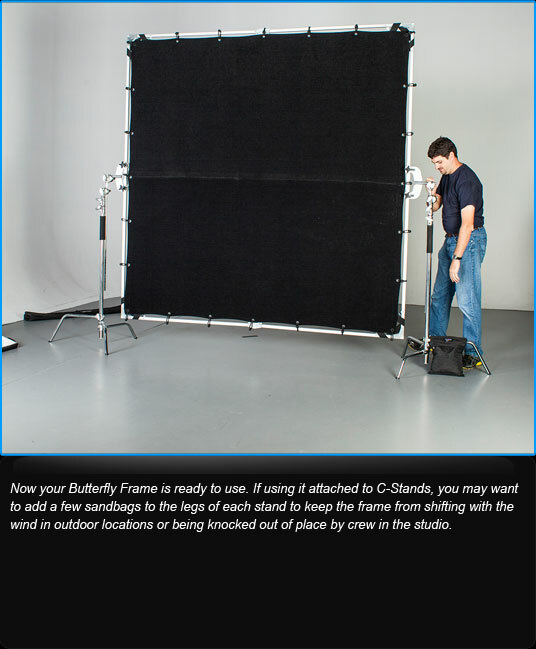 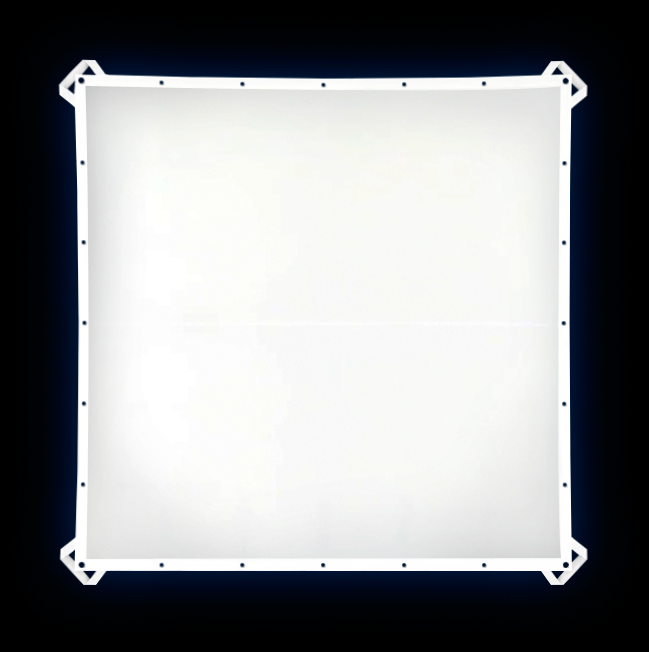 The 8-foot Butterfly Frame consists of 8 hinged 1-inch square tube segments that fold down to a one-piece 4-ft bundle. 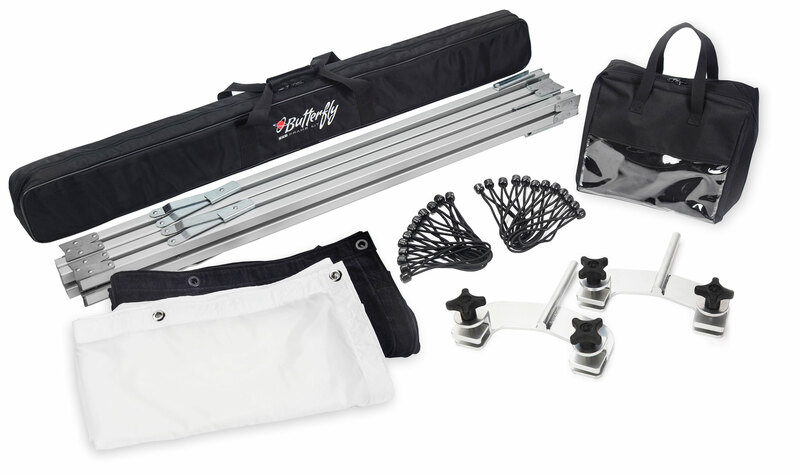 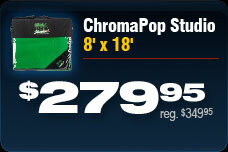 This bundle fits into an easy-carry lightweight 50" bag. 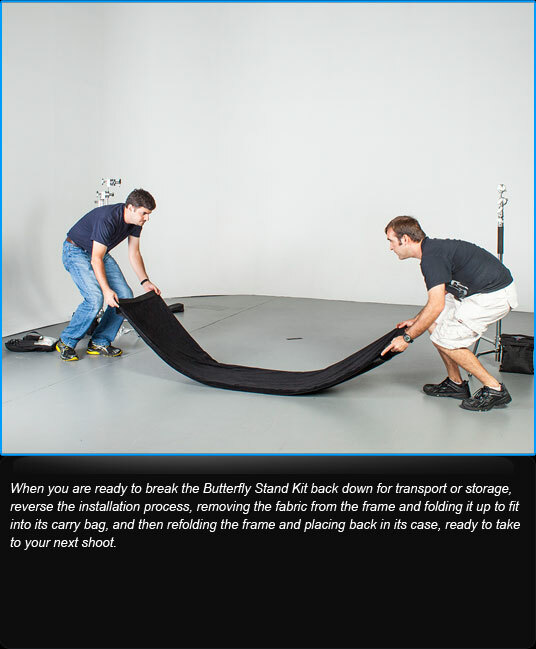 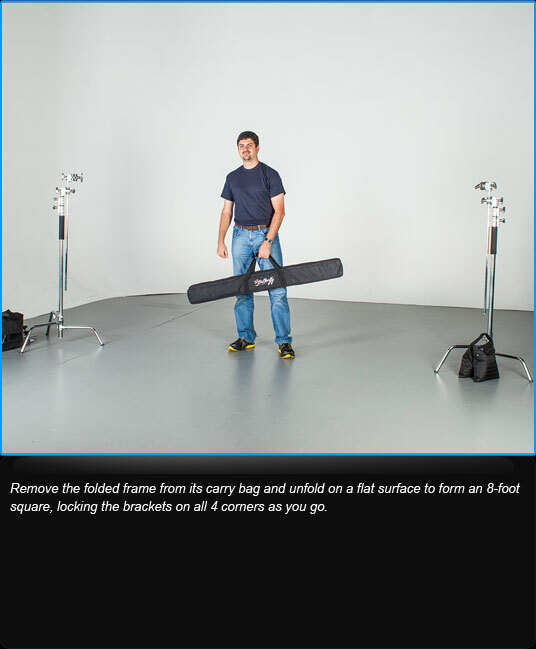 On location the Butterfly Frame Kit can help soften sunlight over an area large enough to cover your talent. 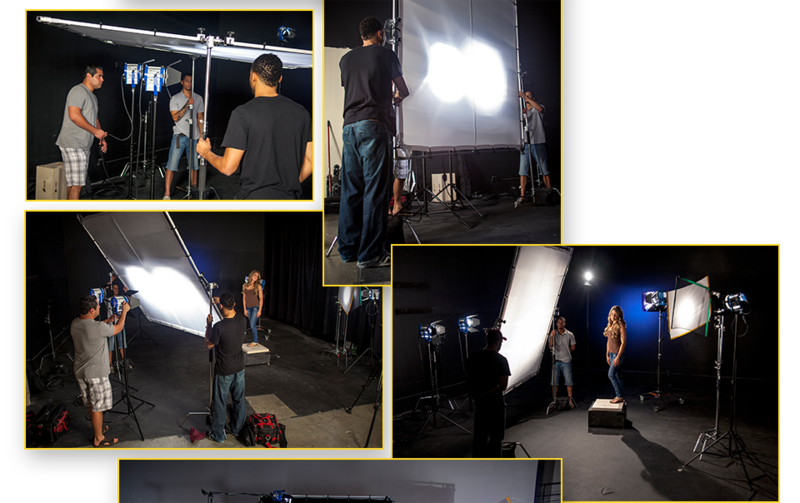 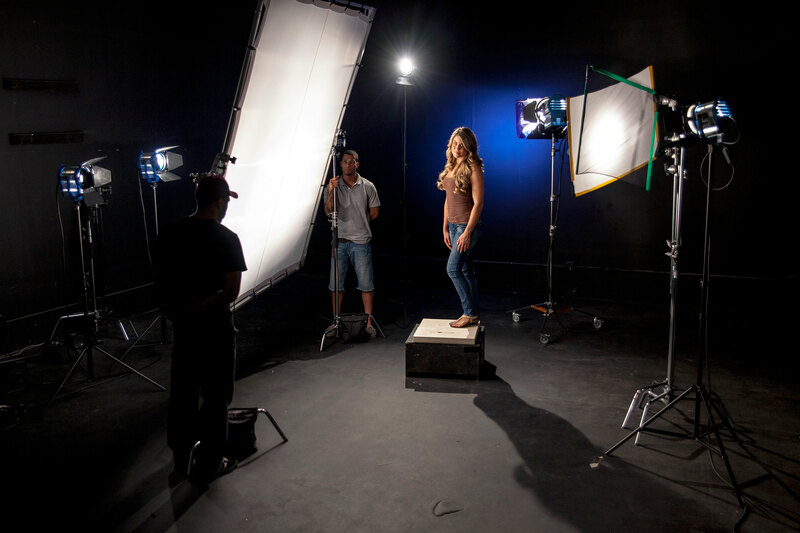 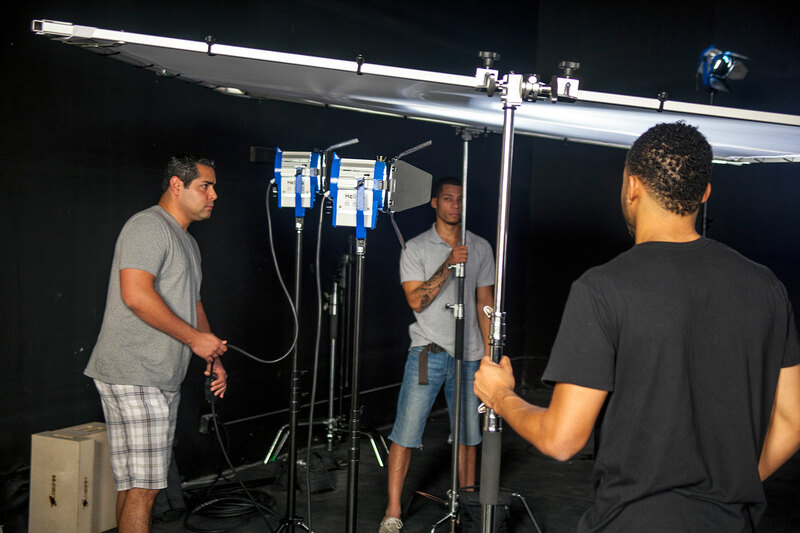 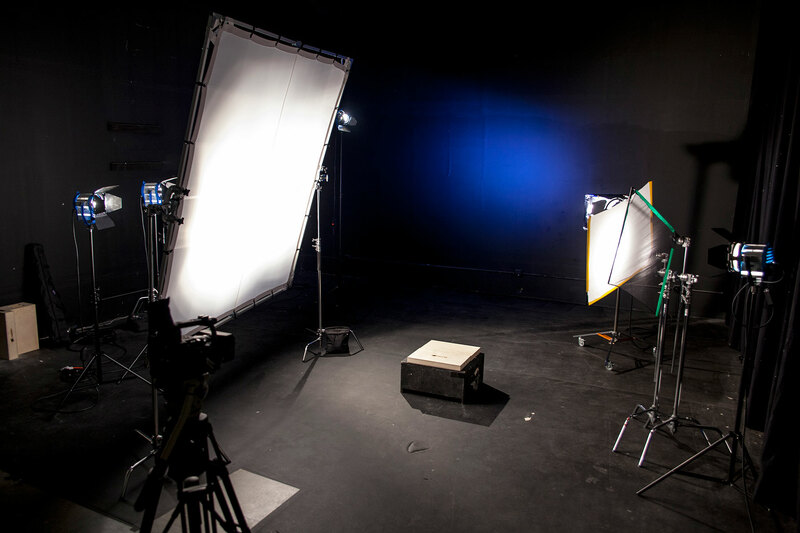 In a studio situation, you can soften one large light source or you can turn multiple lights into a single soft light. 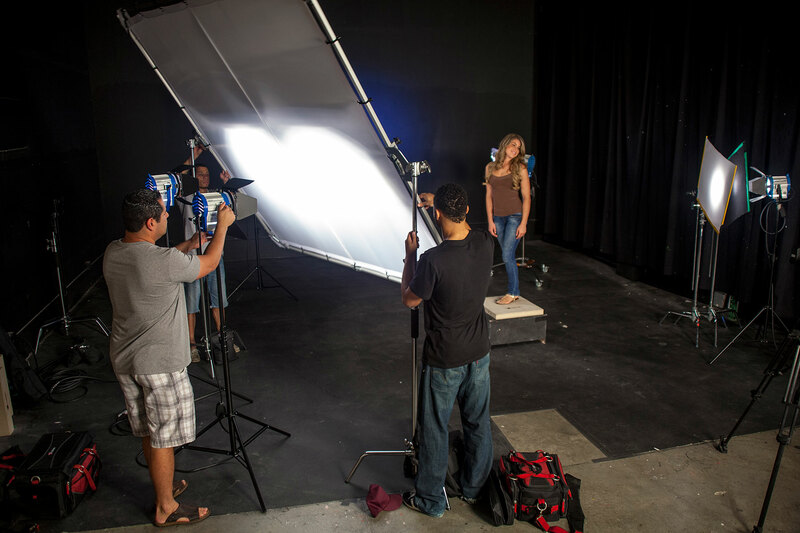 With this kit, you can make almost any light a flattering light. 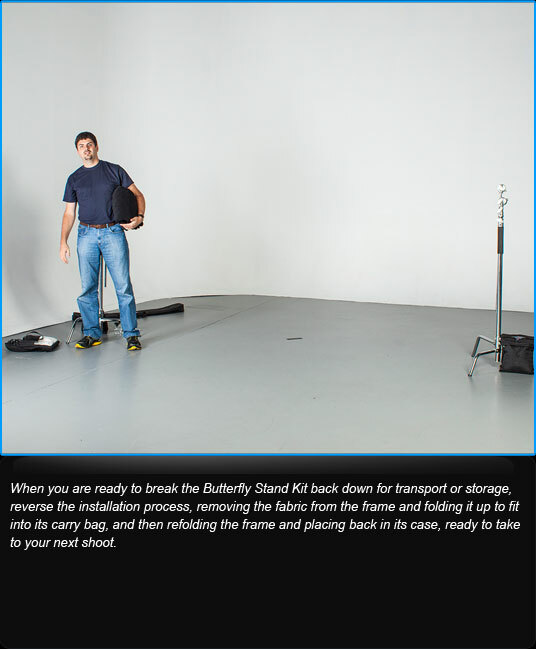 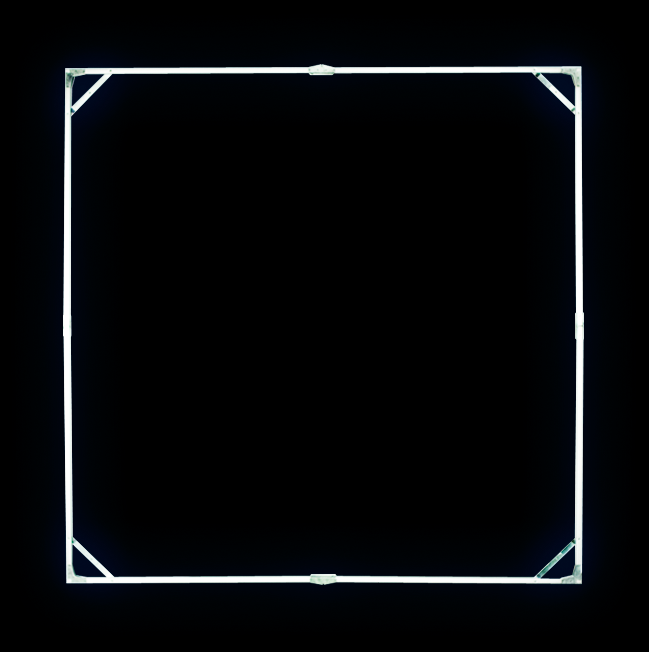 And if you need a negative fill or black background the Butterfly Frame Kit has you covered. 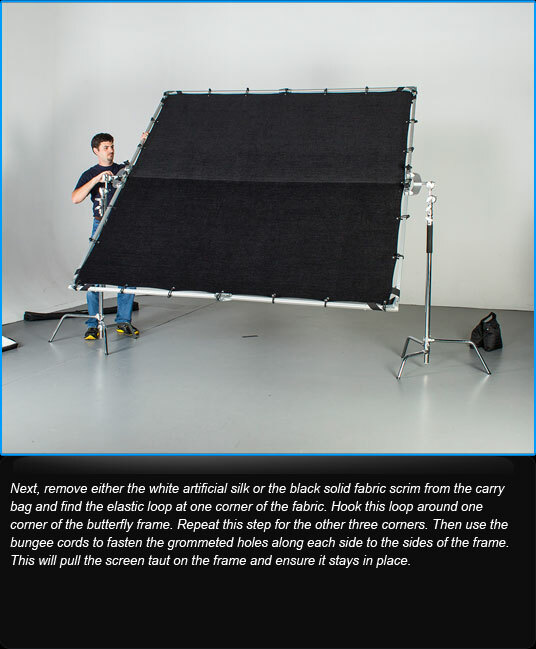 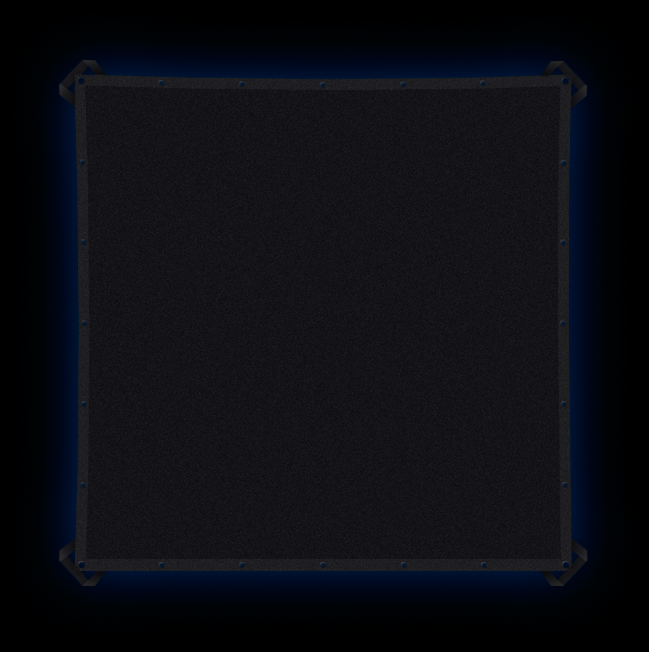 The black solid scrim is made of non-reflective fabric that is perfect for studio product shots or for professional looking portraits. 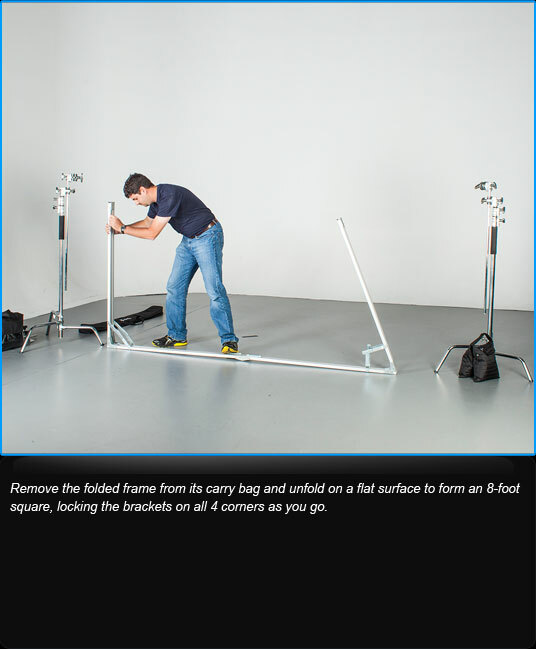 Lightweight materials make handling and carrying the kit easy for one person to do. 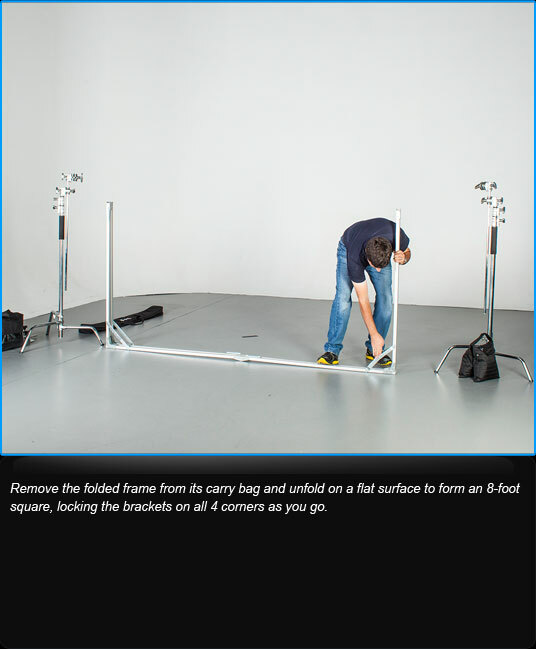 Fold-out, setup and breakdown is quick and easy. 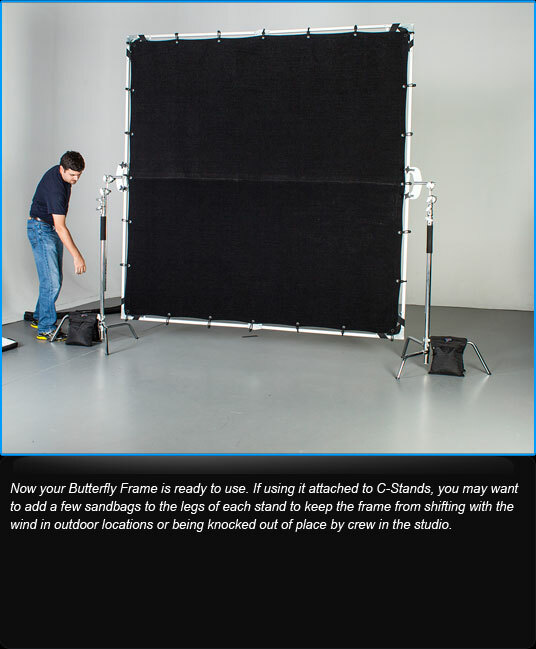 The 8-foot Butterfly Frame consists of 8 hinged 1-inch square tube segments that fold down to a one-piece 4-ft bundle. 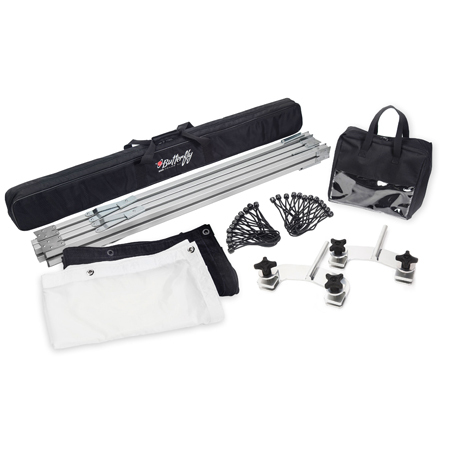 This bundle fits into an easy-carry lightweight 50" bag. 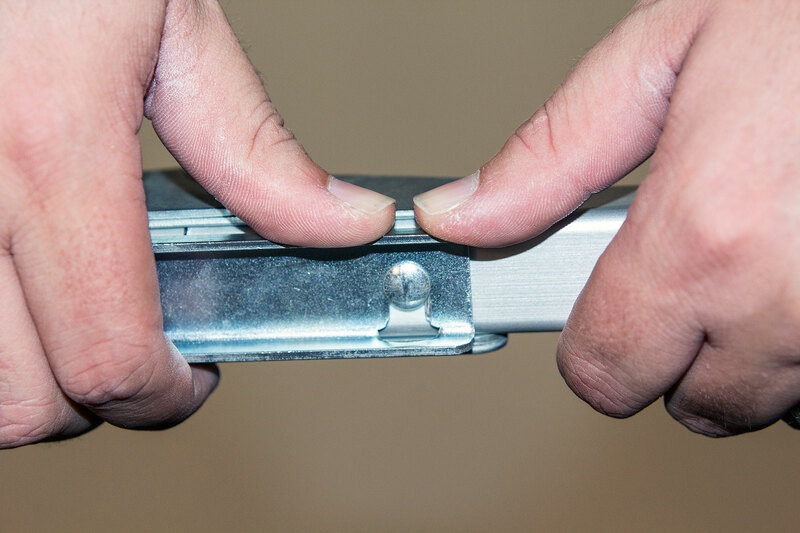 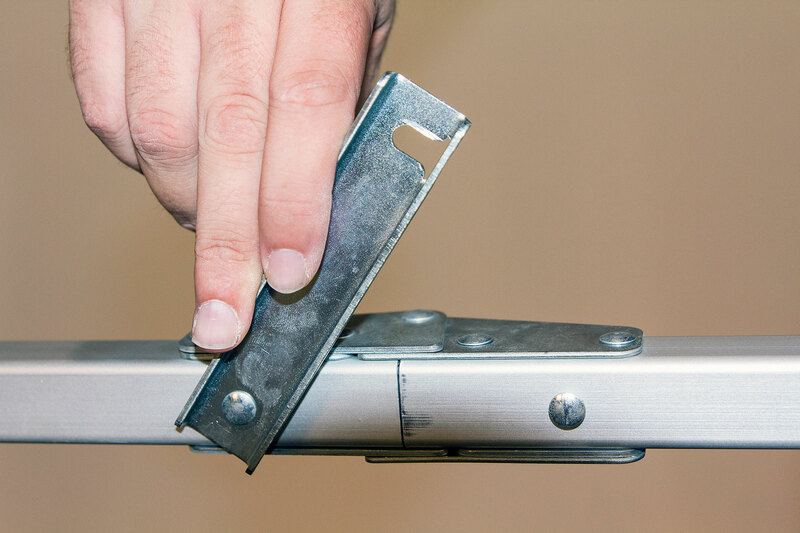 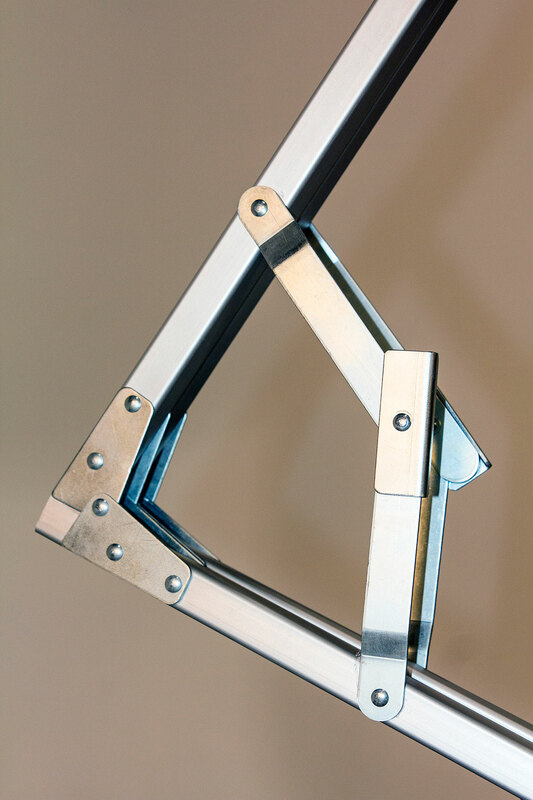 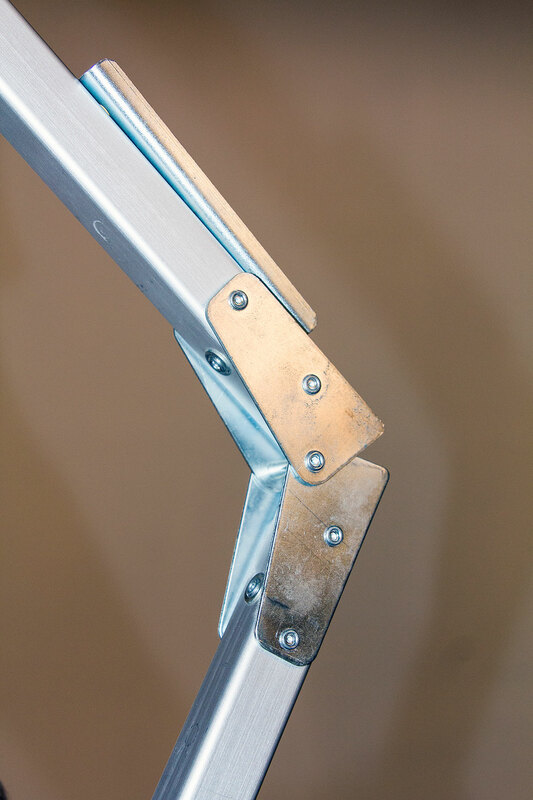 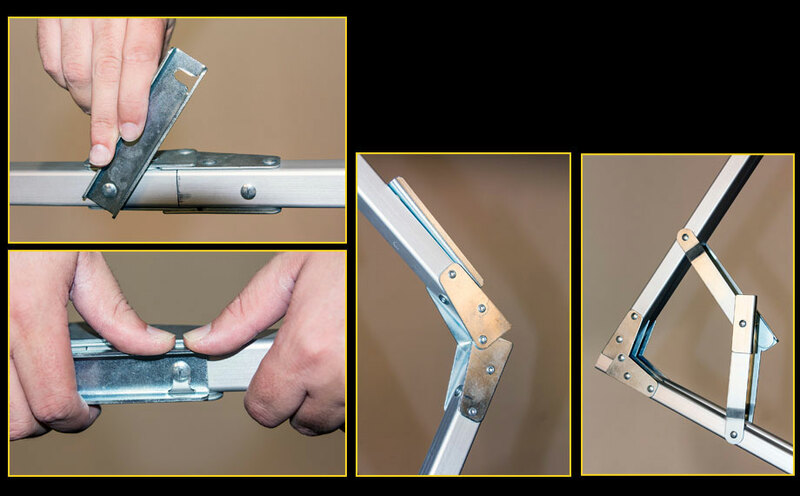 Hinges in the middle of all four sides of the frame have a latch to hold them in place and to keep the frame sturdy when open, while each corner of the frame has locking brackets to keep the frame square. 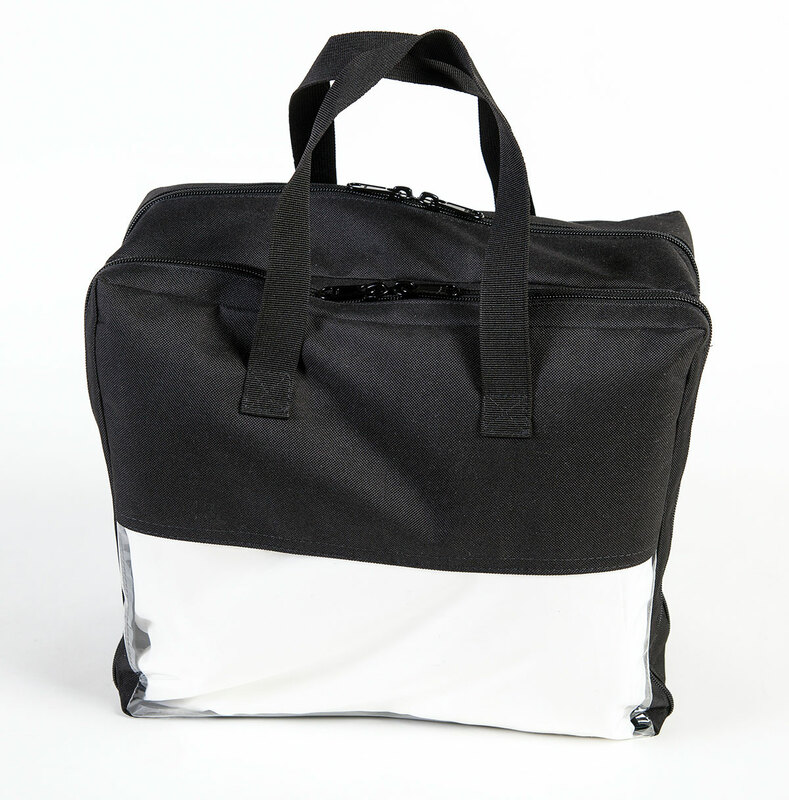 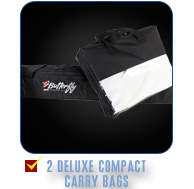 The white artificial silk and the black solid come in their own 13-inch square carry case with plastic windows so that you can easily identify and choose the one you need. 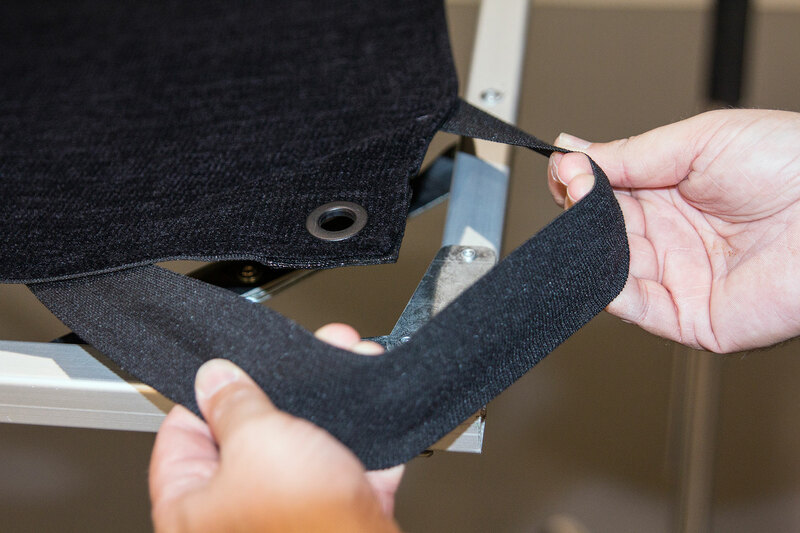 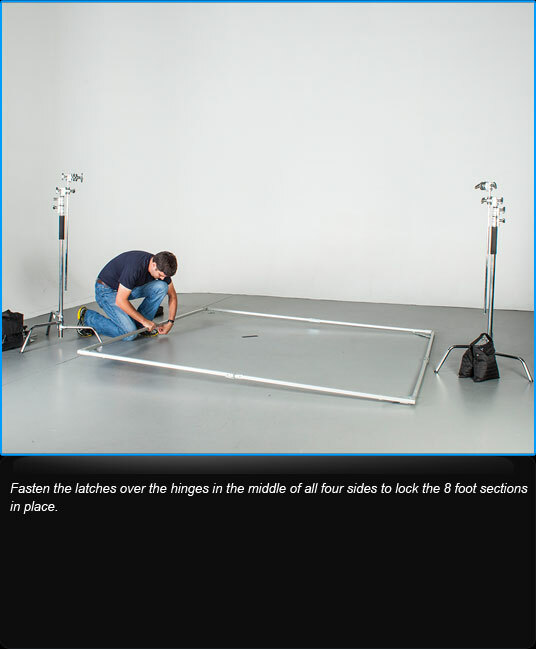 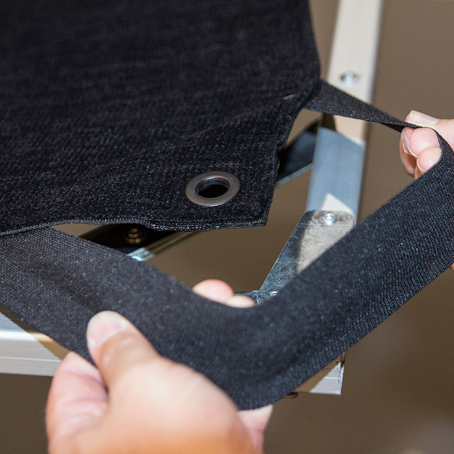 The elastic loop on all four corners of each fabric screen makes getting the fabric on the frame quick and easy. 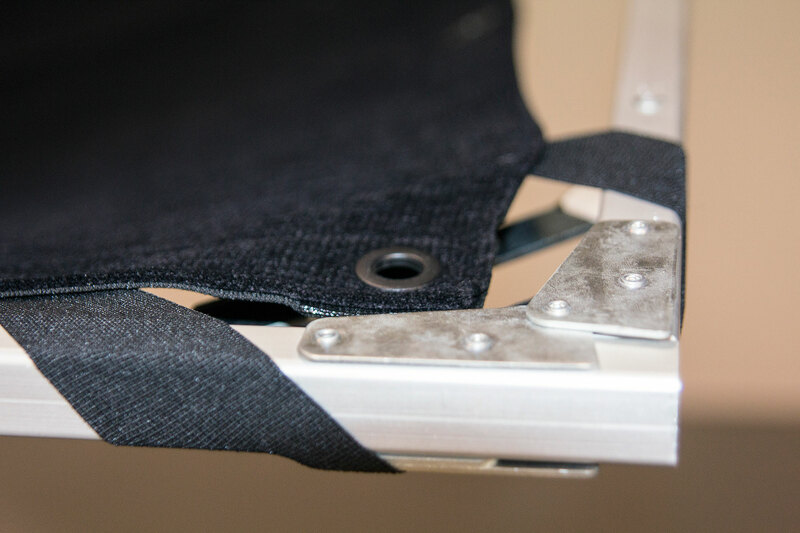 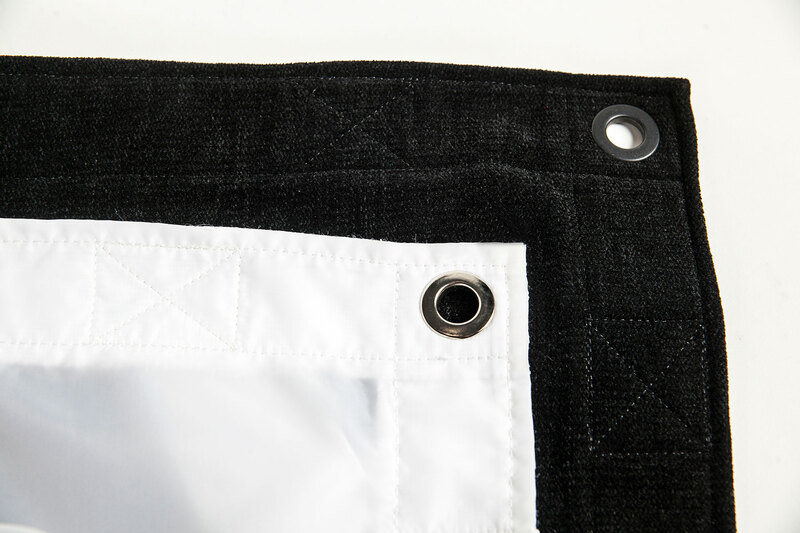 The fabric screens have grommeted holes along all 4 sides, allowing for easy attachment to the frame using the supplied bungee cord fasteners. 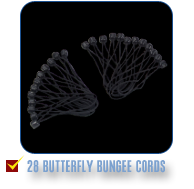 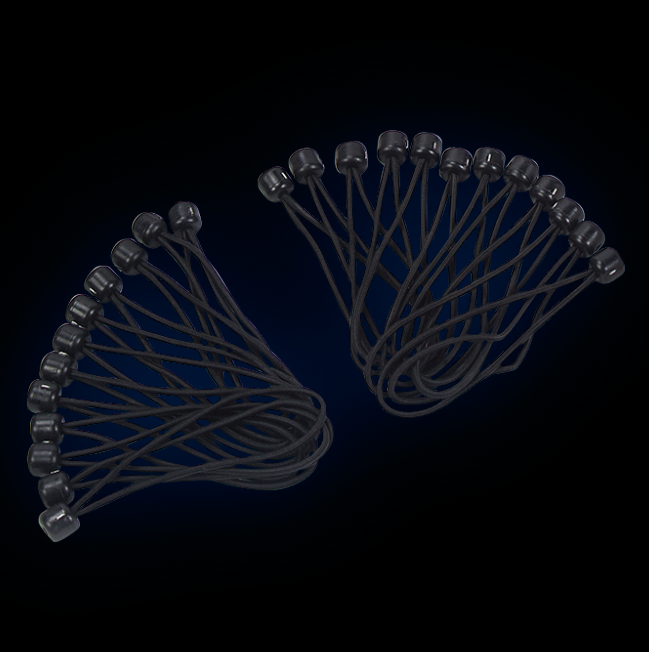 These bungee cords are specially designed for ease of use and durability. 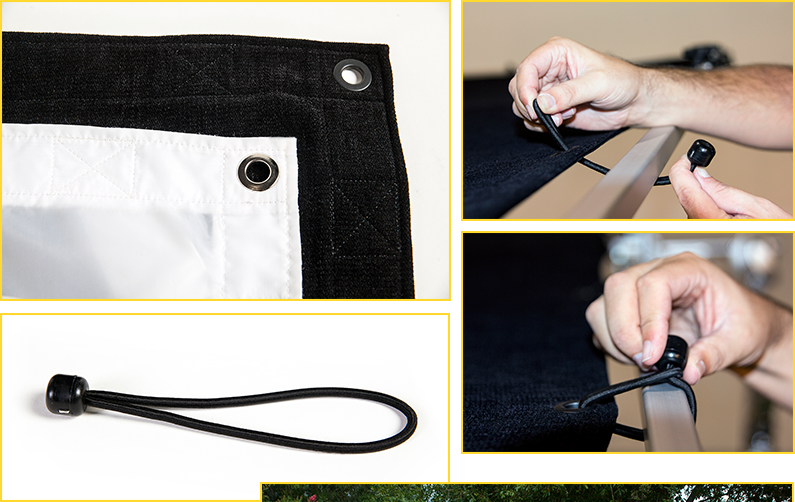 Just insert the loop through the fabric grommet hole while holding the capped end on the outside of the frame. 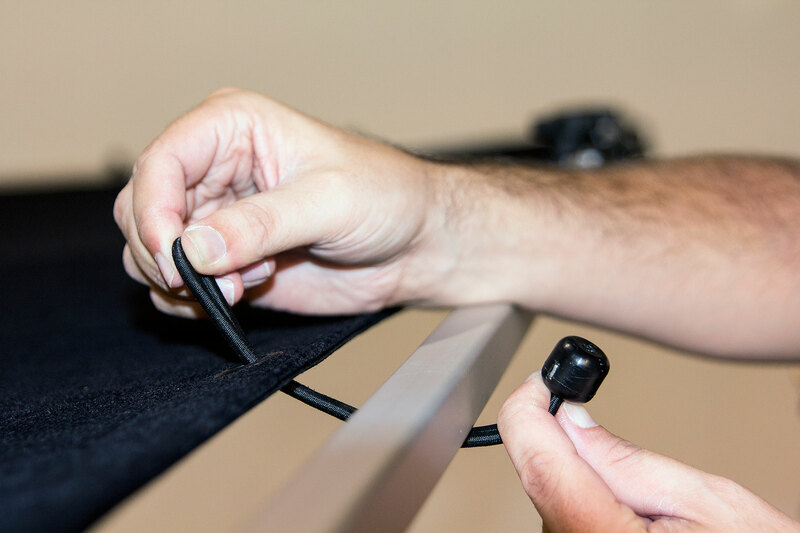 Then insert the capped end through the loop. 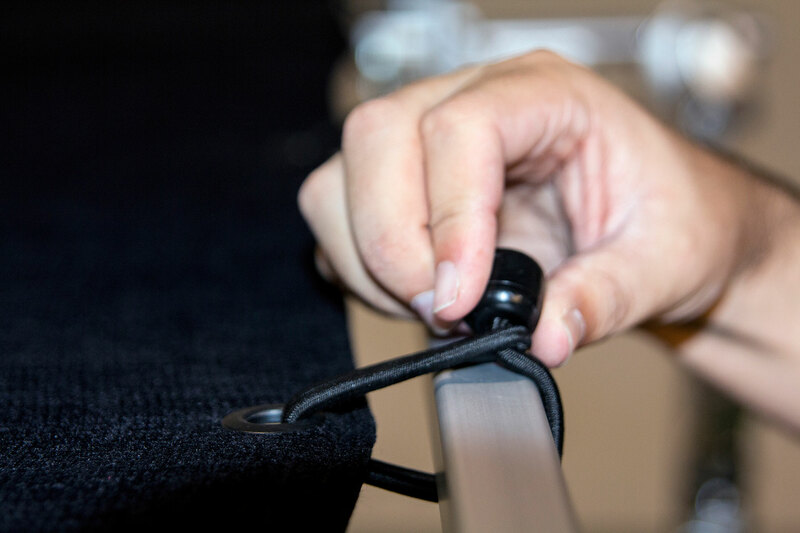 Since there are 6 grommets on each edge of the fabric, this will keep the fabric taut evenly across the expanse of the frame while in use. 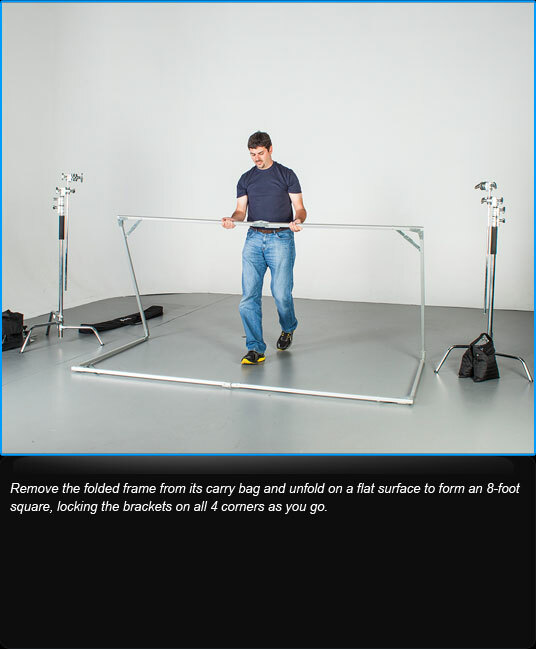 The kit comes with 4 extra bungee cords for your convenience. 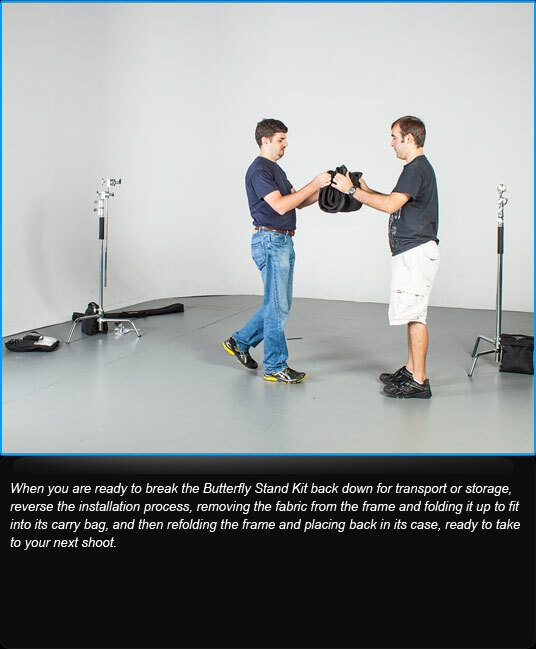 The Butterfly Frame Kit offers you compact transport and storage with its two lightweight easy-carry bags. 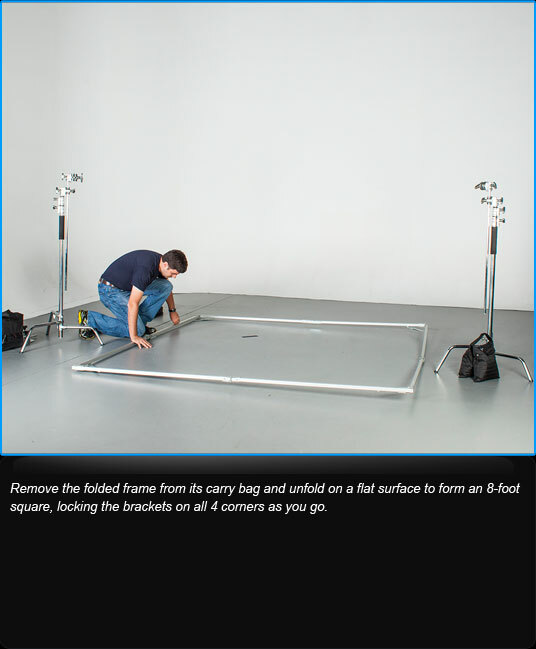 You won't need a truck to move it around or a large studio to store it in. 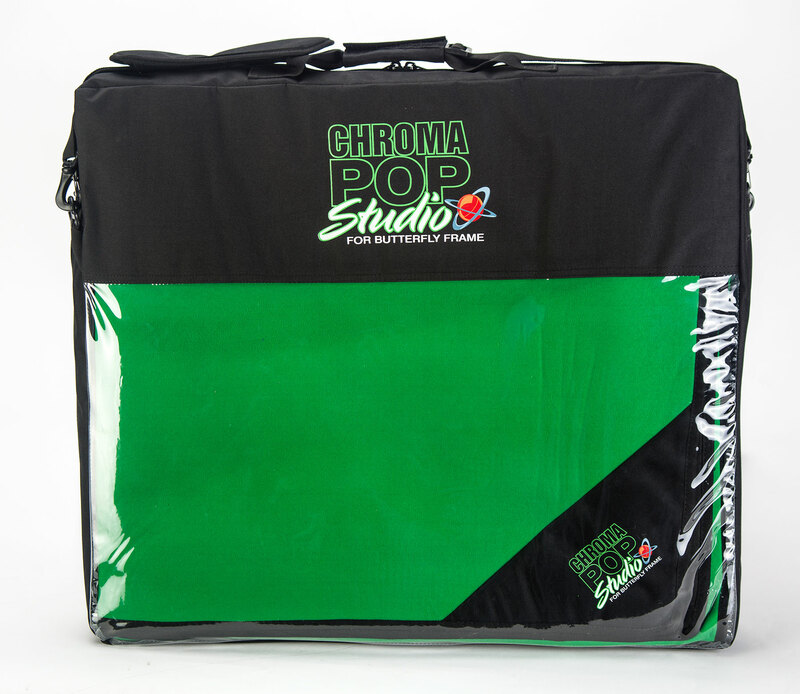 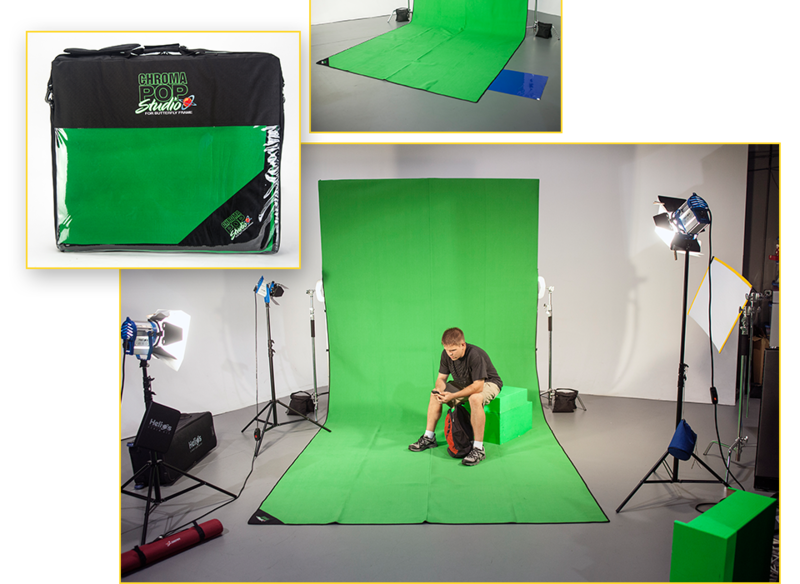 An optional ChromaPop Studio for the 8'x8' Butterfly Frame portable greenscreen kit is also available from Digital Juice. 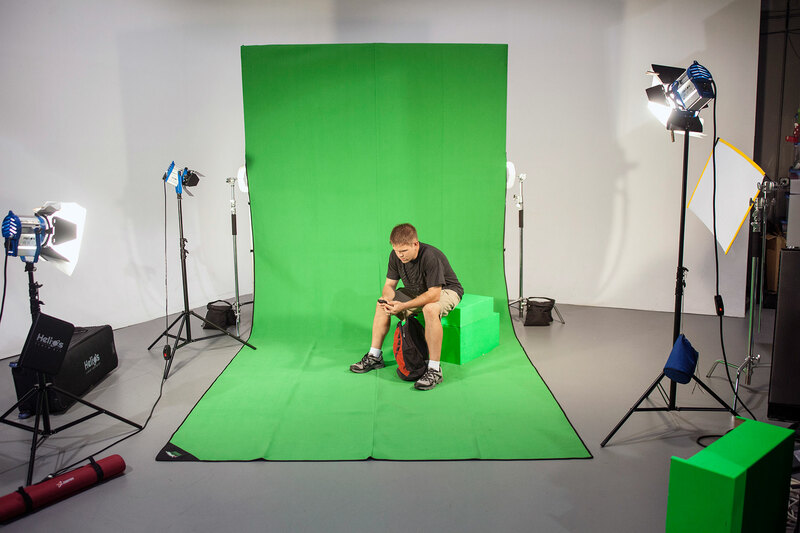 It offers users of the Butterfly Frame Kit a quick, easy, lightweight option for getting the perfect greenscreen shot on location. 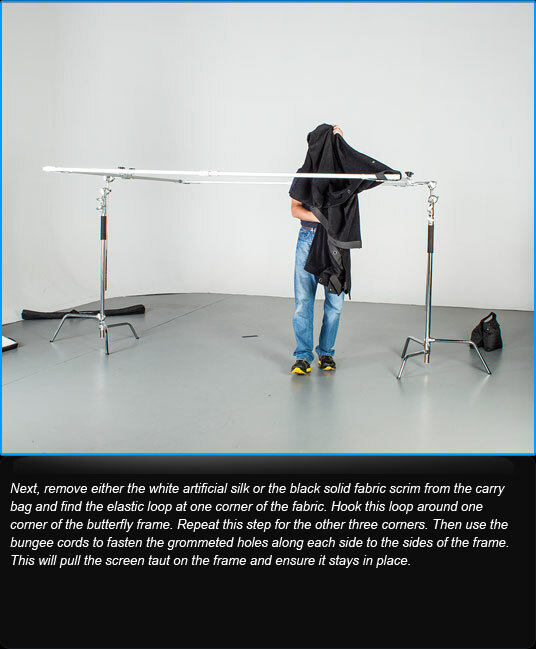 It works as a sturdy solution for outdoors shots at the mercy of wind and weather, while making a perfect addition for anyone planning to use the frame's other screens on a shoot. 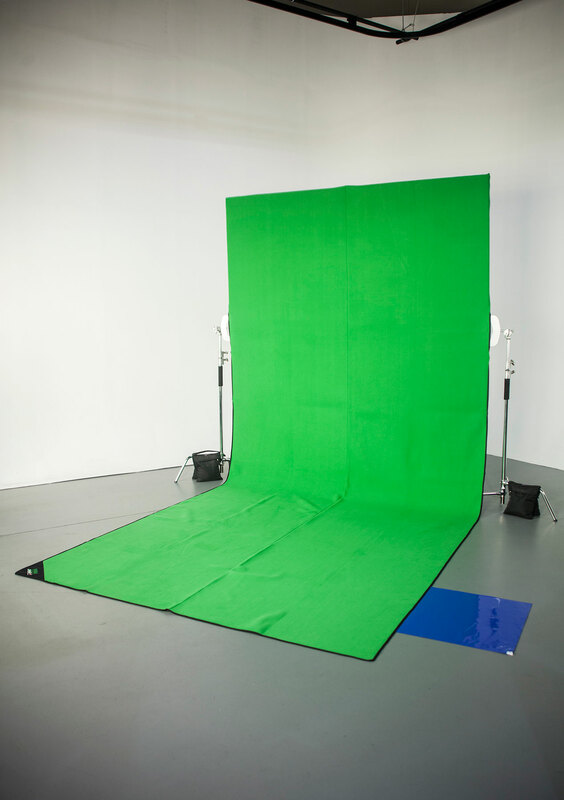 You never know when you might need to catch an extra shot or two against a greenscreen for compositing later. 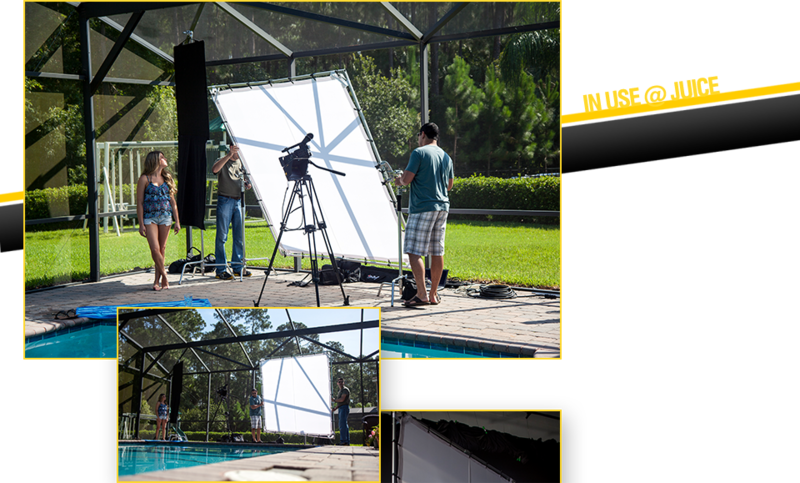 When shooting outdoors you want to be able to use natural light, but often sunlight can be very harsh. 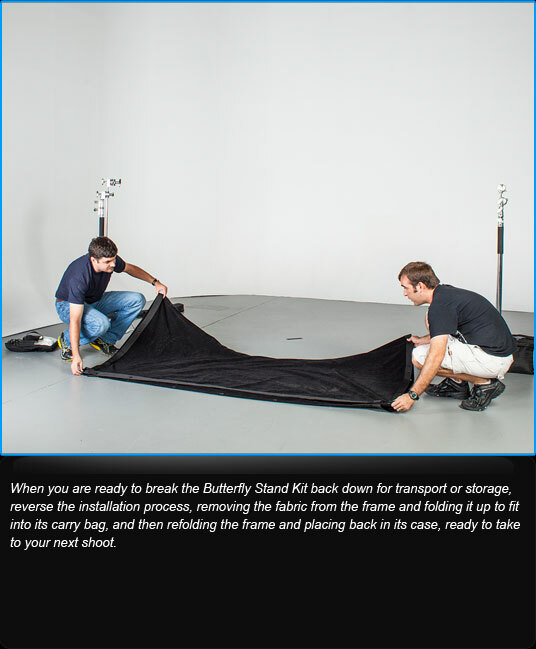 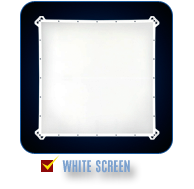 With the Butterfly Frame Kit you can soften the sunlight over an area large enough to cover your talent. 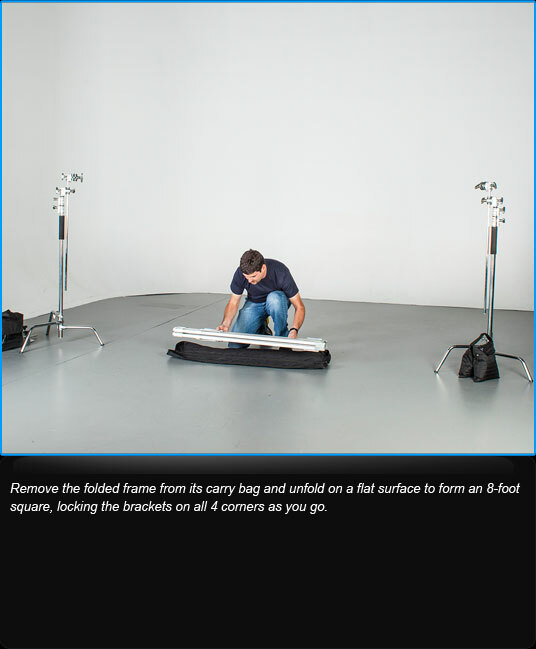 This will reduce your contrast ratio by softening the shadows and help wrap the light around your subject. 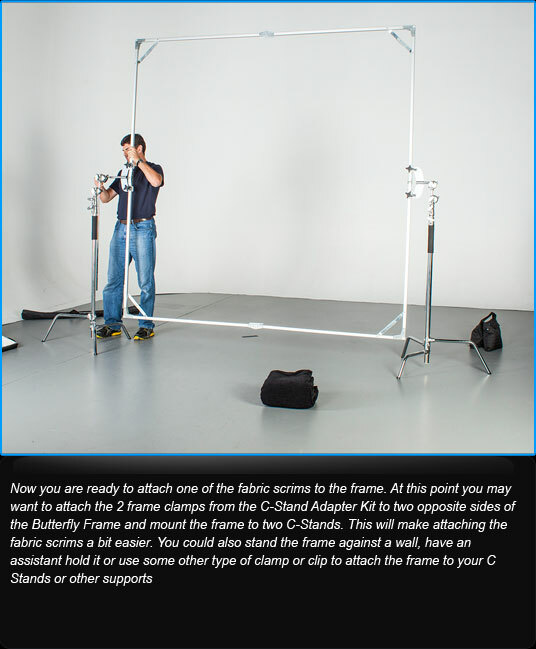 In this set-up we are using two grip stands and the Butterfly Frame C-stand Adapter Kit to hold the Butterfly Frame in place. 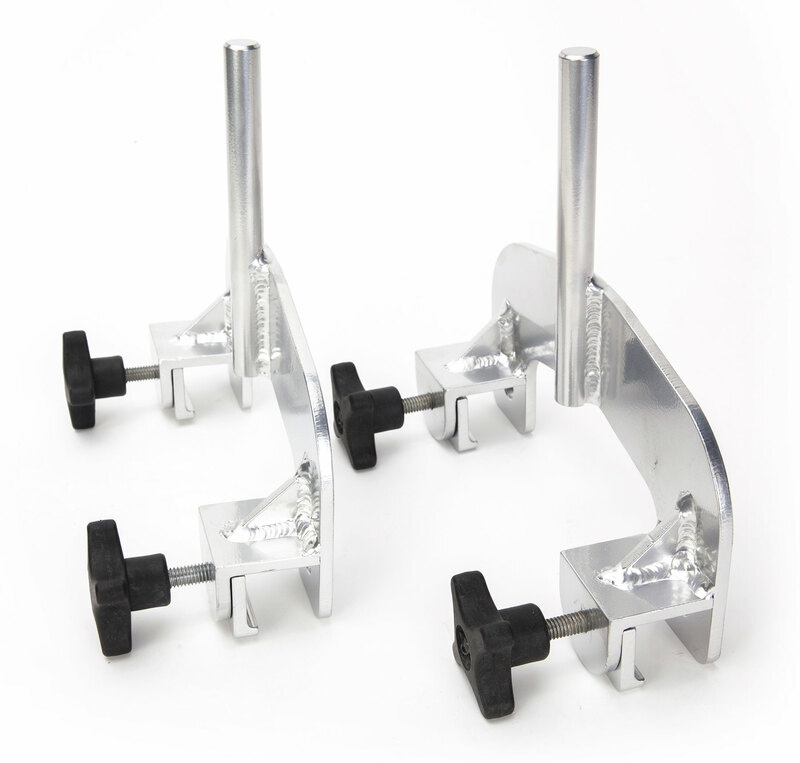 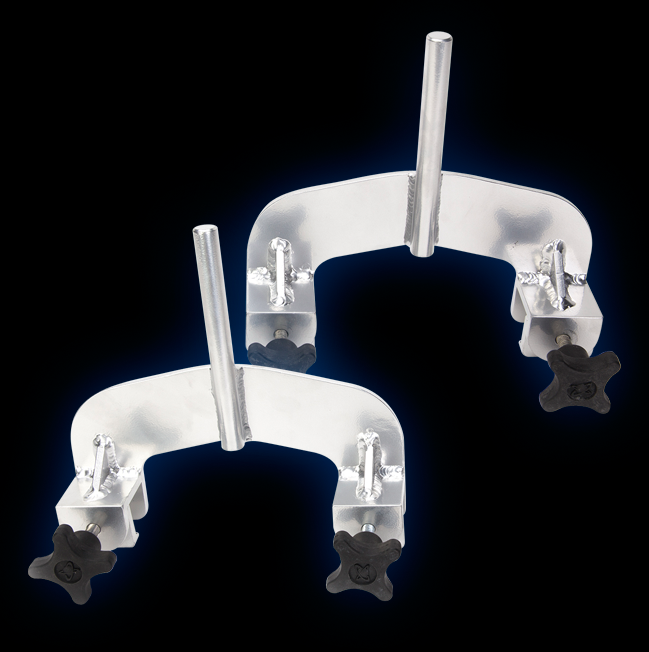 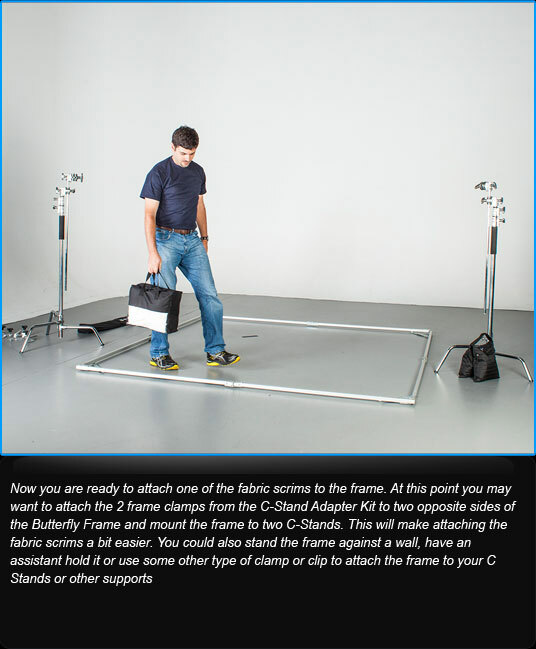 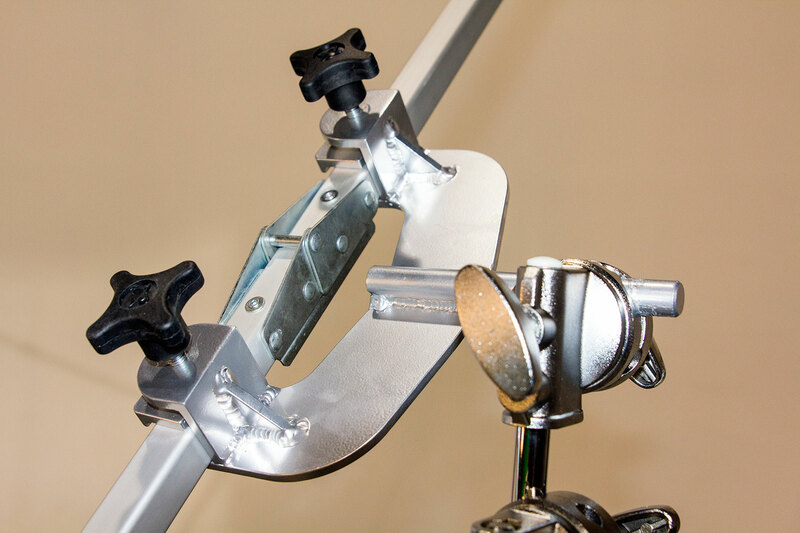 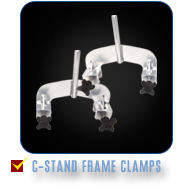 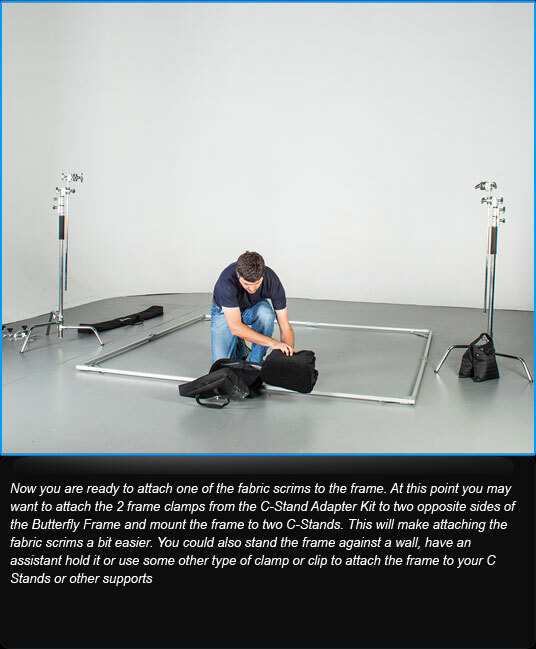 The frame clamps in this accessory kit can make your life much easier whether you are working alone or with a small crew. 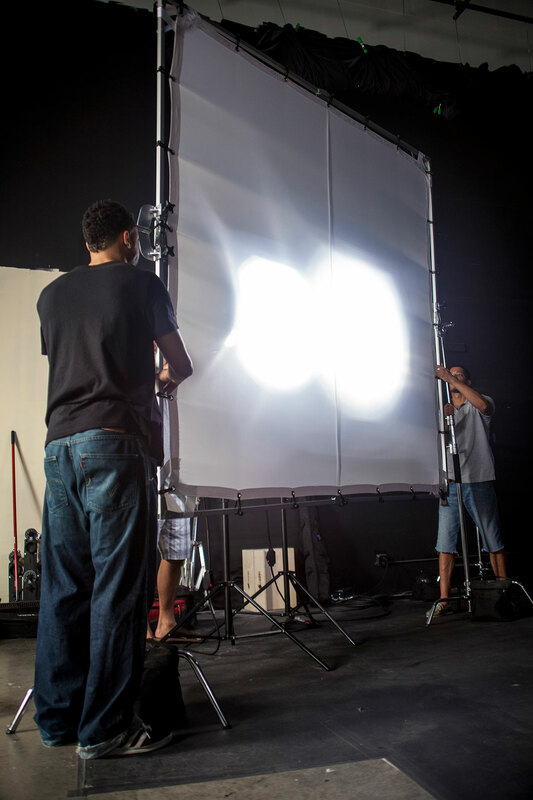 In a studio situation, you can soften one large light source or you can turn multiple lights into a single soft light. 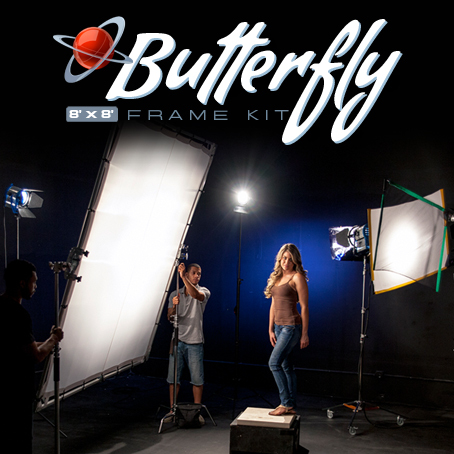 With the Butterfly Frame Kit, almost any light becomes flattering light. 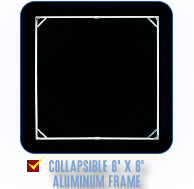 If you need a negative fill or black background the Butterfly FrameKit has you covered. 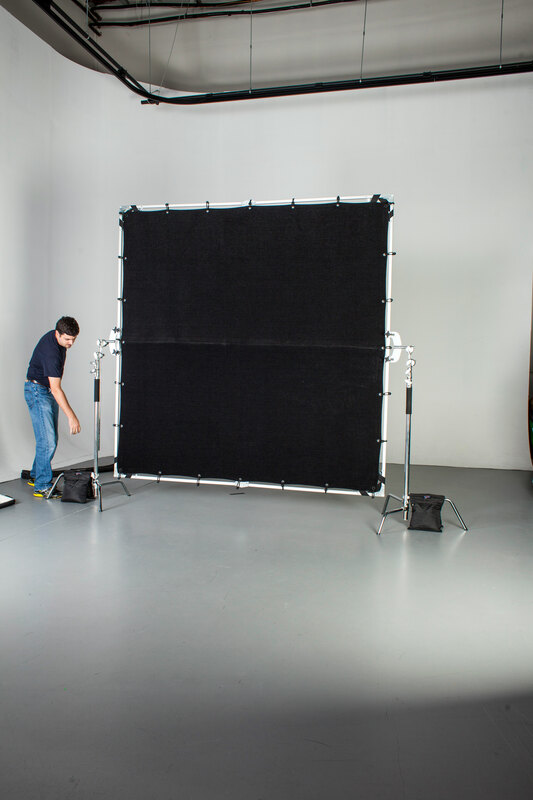 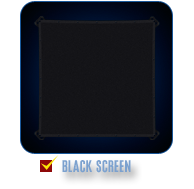 The provided screen is made of non-reflective black fabric that is perfect for studio product shots or for professional looking portraits and interviews.